Last year, Matt Muente dropped out of school, drove a truck out to Colorado, picked up several thousand records, came back to Milwaukee, and — at the age of 20 — opened Industry Records on Center Street in Riverwest. 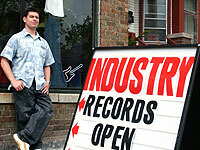 Industry Records specializes in electronic music and hip hop. Muente freely admits, “I’d always wanted to be a DJ but I was never quite [good enough] to actually make it.” Instead, he now focuses on providing Milwaukee DJs and electronic music fans with records and equipment — including about 5,500 records, turntables, needles, mixers, and t-shirts. So far, the store has been successful. Rent is $600/month, and expenses are low. (Muente has no employees.) The store has already earned enough to cover the next month’s rent and expenses. The store is also filling a niche. Muente visits Chicago often to look for new music, and tries to stock records previously unavailable in Milwaukee. After opening his store, he also realized that many Milwaukee DJs live in Riverwest. “It was unexpected what a good location I’d have for my store,” he said. Muente hopes to start promoting local DJs and events and plans to expand the record selection. (He just placed an order for $5,000 of merchandise last week.) A mail-order web-site and E-bay online store are in the works. He is even thinking about opening a bar or restaurant in the area.